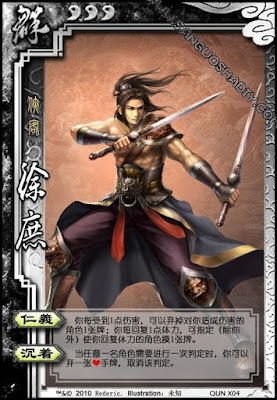 For every unit of damage that Xu Shu receives, he can discard a card from who hurt him. For every blood another player gives him, he can allow them to draw a card. Before any player performs a judgment, Xu Shu can discard a heart. The judgment is then skipped. When Xu Shu is damaged, he gets to choose the card to discard. This can be from the hand or something equipped. Xu Shu cannot allow himself to draw a card from healing himself. When Xu Shu skips a judgment, it is like it never happened. For lightning and other pending cards, they stay on top of a player, but their effects are put off. If he cancels a player's Eight Trigrams judgment, the player will then have to play an escape, as if they decided to not flip a judgment.